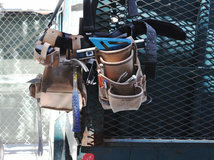 It seems like every year a new type of high-tech device becomes an essential part of our lives. But we could all do without seeing the countless cables it takes to keep these devices charged and ready to go. 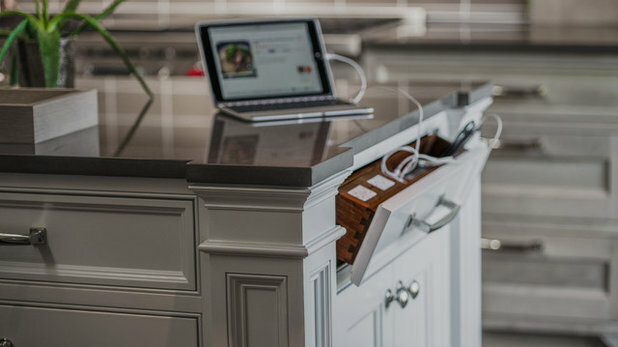 To help keep your devices powered up, and your surfaces free of busy cables, here are some of my favorite solutions for integrating charging stations into your kitchen and elsewhere in your home. 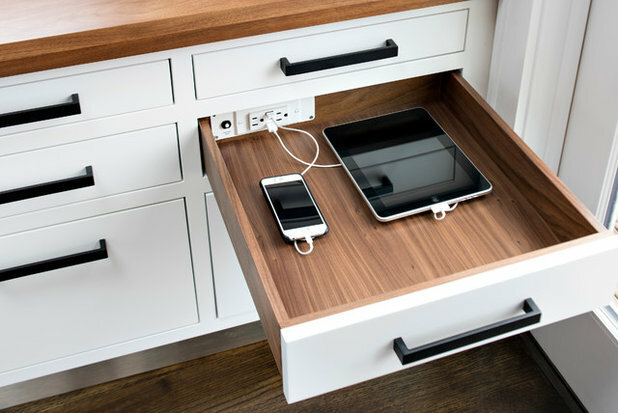 Placing a charging station inside a drawer works well because the most common devices that need to be charged (tablets, phones, laptops) are typically flat. 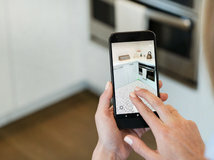 Laying them inside a drawer means you don’t have to worry about them falling off a stand or getting knocked to the floor, which often results in a cracked screen. 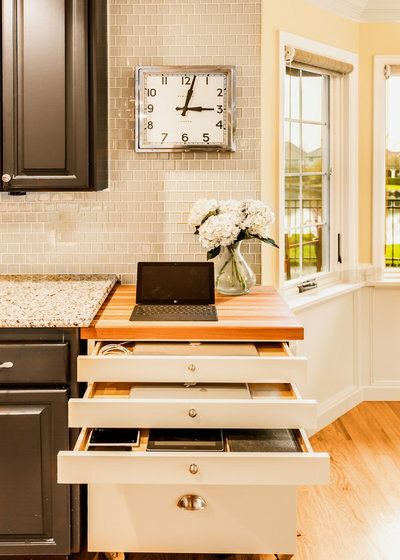 Also, if you really like keeping technology out of sight and out of mind (especially in a more traditional kitchen where glossy black screens don’t exactly fit into your look), a slim drawer isn’t much real estate to give up, and it can be shut to put your devices away for a mental break. 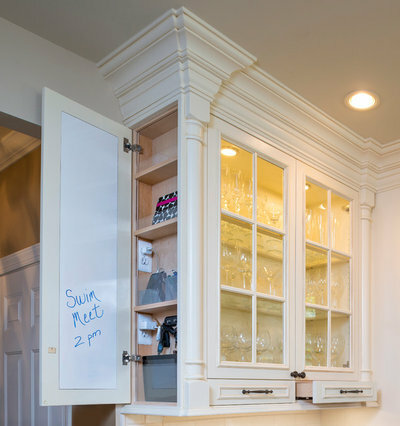 Integrating a solution like this is especially easy in a cabinet that already includes powered items such as built-in appliances. 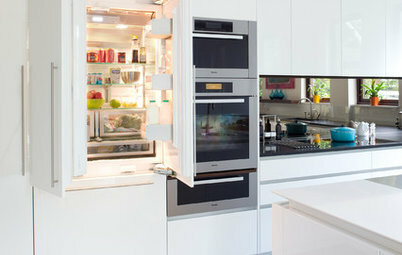 Notice how in-cabinet units like this tend to use a power bar with surge protection. 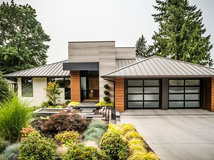 Safety features such as this will reduce the risk of an electrical fire and often are required by building codes, so be sure to speak with a knowledgeable professional about the best way to install any of these devices. 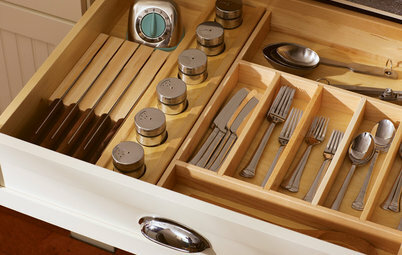 Sometimes, depending on the configuration of your cabinets, you may have a space for a small tip-out drawer but not a full-depth drawer. 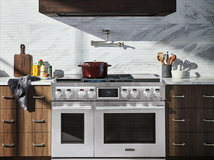 This is often the case in front of a sink or built-in range, or when something else fills the upper portion of a base cabinet. 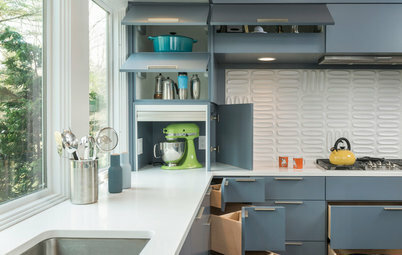 In this example, the space behind this tip-out drawer is actually used up by a full drawer accessed from the adjacent face of the island. The space left is small, but it needn’t go to waste. 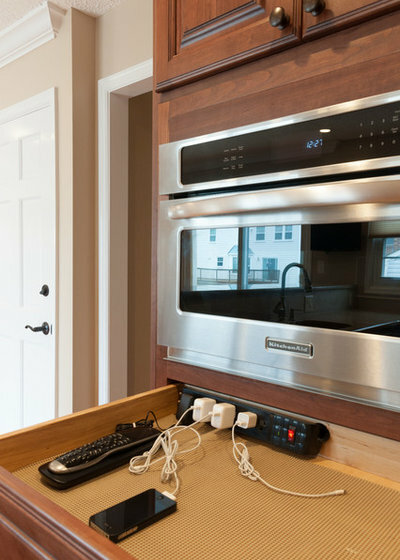 A space like this is an excellent size for holding just a few power ports, which can then be used to charge an item sitting on the counter, such as a laptop or wireless speaker. 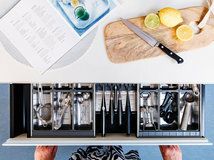 You can leave the drawer open while it’s in use without having a full-extension drawer protruding into your workspace, so it’s a smart solution for busy spots in your kitchen. 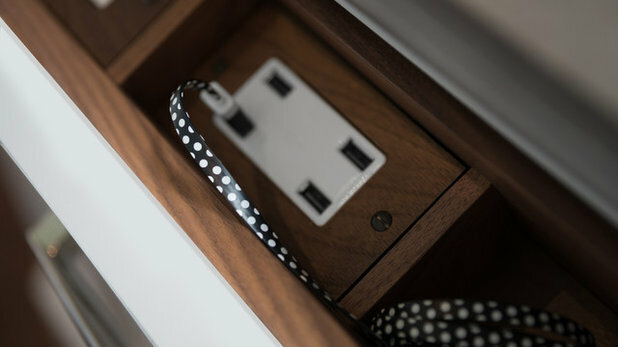 Notice how this drawer actually uses some USB ports instead of typical electrical outlets. This means all you need is a cable to plug in your device, and you can skip the adapter. 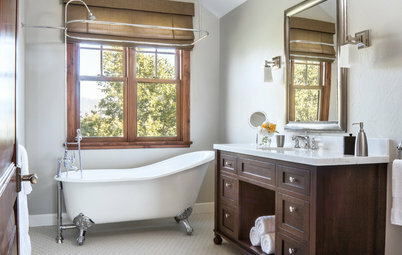 When you have a small space or when you’re in a rush, that little change can make a big difference. USB outlets are quite common these days and can be found online or at your local hardware store. 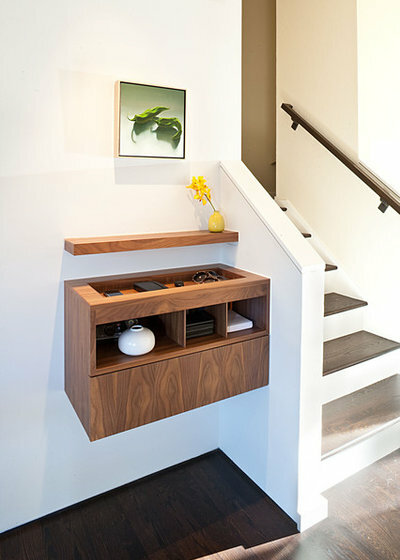 If you prefer to have charging stations instantly accessible and don’t mind them being a bit more visible, try integrating them into open shelves, or little nooks in a pass-through space like this. Your small devices will be easy to tuck away, and they’re partially hidden from view for a decluttered look. Sometimes it’s not the devices you want to hide, just the many cables. This clever ledge has an angled back and a lip at the front that lets items lean back and stay in place while also covering up your view of any outlets or cables. 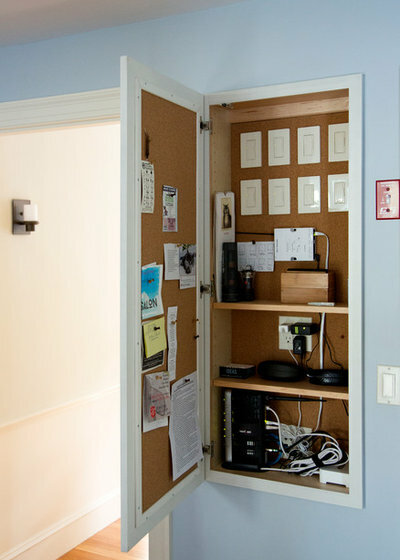 Add a corkboard and you’ve got a fun feature that keeps the devices from being the visual focus. 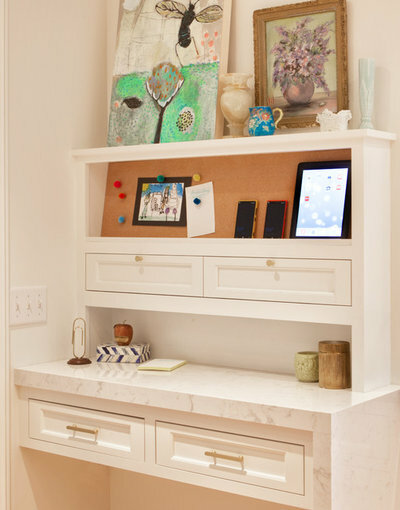 A small cabinet or console like this one, situated in a hallway or entry, can be a great place to drop your devices when you come home. If you’ve got modern wireless headphones with a chargeable battery, this is also a great place to charge those so they’re right by the door next time you head out. 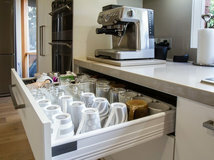 A small hole cut into the back of the cabinet can allow access to an outlet so you can tuck items away in open shelves or compartments with doors. 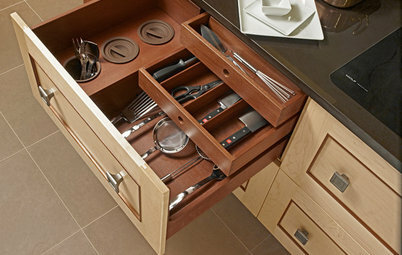 Similar to a tip-out drawer, a shallow cabinet like this can be a great way to use a thin space left at the end of a larger cabinet. 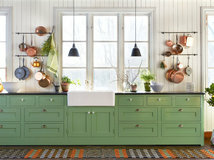 A simple cabinet with doors is generally a less expensive solution than drawers and offers plenty of functionality. Include a deep lip on your interior shelves and you won’t have to worry about large items falling off. 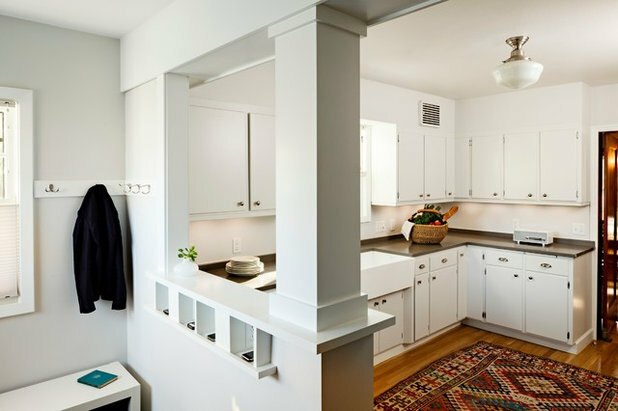 Small spaces like this are often created in more traditional styles of cabinets with corner features that prevent the front doors from reaching edge to edge. 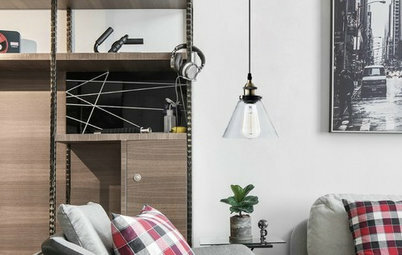 Rather than letting that space go to waste or compromising the look, use the extra sliver of space for a little charging nook. You can also include a whiteboard for daily reminders and notes. 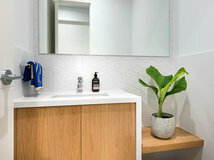 Storage niches are commonly used in bathrooms to get extra space for medicine cabinets or to house bath products in the shower, but this concept can be used in other rooms as well. 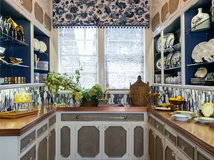 A storage niche in the kitchen or office steals a bit of unused space to hold items such as a wireless internet router. While the wall is open for creating the niche, why not use the opportunity to route in power for a charging station as well? Don’t like the look of a charging station, even behind closed doors? 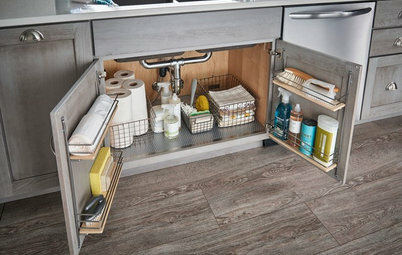 Put a small charging station within a mixed-use cabinet to distract from the “tech” look, and leave a few compartments free for your devices while allowing other shelves to hold attractive baskets, books or other items. This can be a great option for a mudroom, laundry room or entryway where you already need storage for other items, and the charging station is a great bonus. 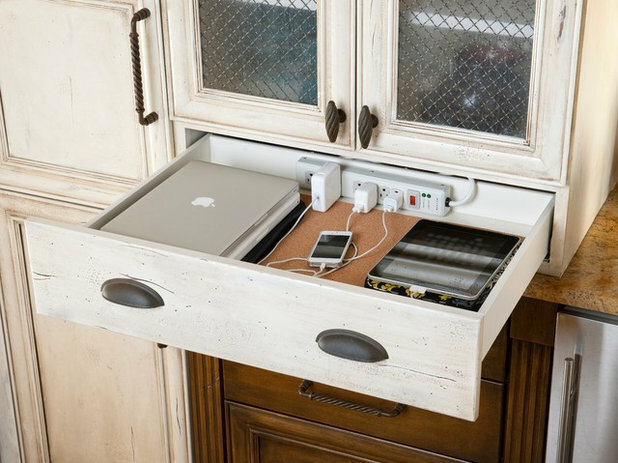 Keep in mind, a handy charging station doesn’t always have to be part of a built-in cabinet. 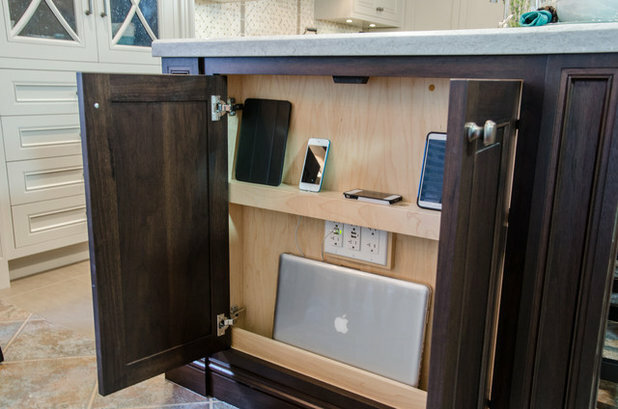 A freestanding hutch or cabinet can be a great place to add a charging station without having to retrofit any existing cabinets. Your turn: Got a smart solution for charging your devices? Share yours in the Comments. 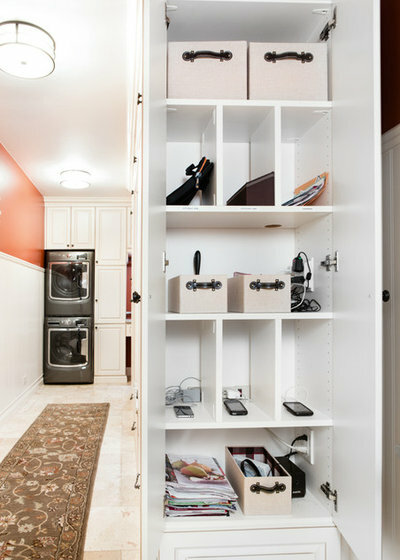 We planned to have drawer charging stations in the kitchen and around the corner in the desk area in the great room addition. Problems locating an electrician AND keeping them on site led us to instead use Legrand angled strip outlets under the kitchen cabinets all the way around the corner into the great room and over the desk. 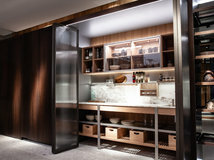 The strips provide the plug in under cabinet lighting as well as opportunities for several other plug in gizmos that Legrand manufactures. There are no wall outlets in the kitchen. 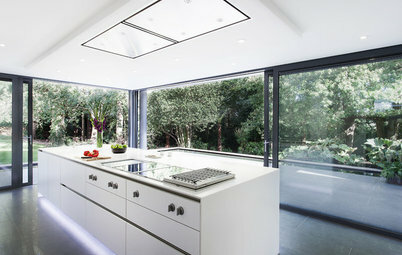 We used narrow black strip outlets in either side of the island tucked in under the granite. They both are invisible while providing more outlets than we'll ever need. While we didn't rid ourselves of the cable clutter, this solution provides charging locations convenient to practical life and the many devices we use every day. 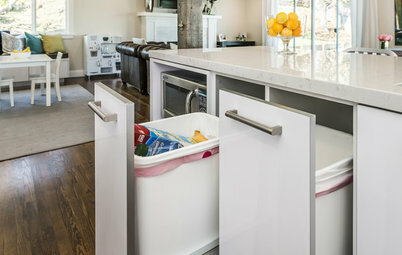 These are good measures to eliminate clutter with a place for everything and everything in its place. 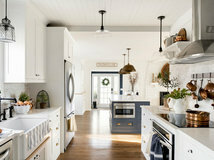 Kitchen Design Disappearing Range Hoods: A New Trend?